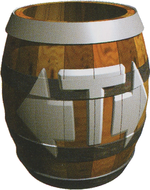 The Tracker Barrel is a type of Barrel that appears in Donkey Kong Country 3: Dixie Kong's Double Trouble! and Donkey Kong Land III. This special barrel allows the members of the Kong Family to cross large horizontal gaps. When jumped into, the Tracker Barrel will shoot the Kongs straight up in the air, then follow the heroes left or right during their descent. As such, the Kongs will simply fall back into the barrel, and then be shot back up in the air again. This process will continue until the heroes reach land or another Tracker Barrel. Tracker Barrels always moves horizontally, and never changes altitude. Tracker Barrels are typically found in waterfall levels, as these types of levels are often plagued by large horizontal gaps. In Donkey Kong Country 3: Dixie Kong's Double Trouble!, they are only in Tracker Barrel Trek, whereas in Donkey Kong Land III, they are in Rocketeer Rally, Footloose Falls, and Rickety Rapids. The Tracker Barrel is emblazoned with the capital letter "T" surrounded by two arrows, one pointing left and one pointing right. The "T" stands for "Tracker", while the arrows represent the barrel’s ability to track the Kongs horizontally. This page was last edited on February 17, 2019, at 23:36.